Mother Nature has been alternating snow with sunshine today. It's bitterly cold outside, but I like it. It finally feels like winter. 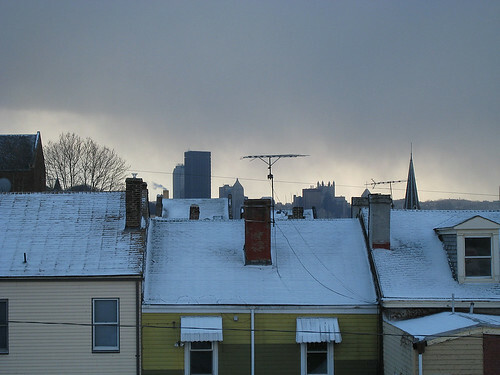 The photo is a shot from the third floor window of our house. My new camera has quite a zoom on it! I love that I can see the downtown skyline. So pretty. Here's a wider view. Work is quiet this week so I've been getting home early which is awesome. Today I decided to take some time out to knit. It also provided a good excuse to get caught up on the new season of The L Word. I didn't even know it was back on until last night! 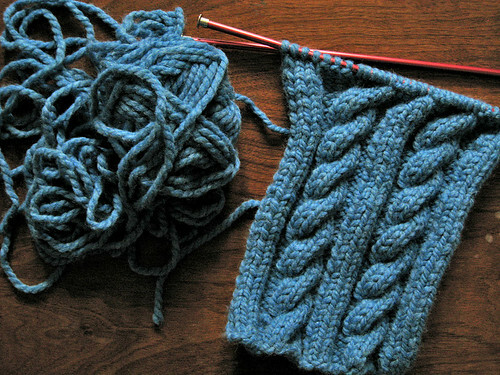 As for my knitting, I keep making silly mistakes so it's taking me awhile to get through this project. I am making a cable knit handbag, inspired by this tutorial. I love cable stitches.